On Twitter, Todd Vaziri posted a series of tweets pointing out that domestically and worldwide, the vast majority of films this year are adaptations or sequels. I and others pointed out that his point of comparison, 1981, was a bit odd; why a year 14 years in the past? And do two years adequately function as evidence for any sort of commentary? Todd suggested more investigation was warranted, and I agreed. There’s often an implication with these sorts of comparisons, not asserted by Todd but often declared by many others in many different places, that movies “back in the day” were better, or at least more original. To take on that thesis, insofar as that you can objectively argue what are adaptations and sequels versus original works, I went through Box Office Mojo’s yearly domestic box office charts, and picked the original films out of each year’s top twenty. In regards to actual classification, it’s worth noting upfront that this is really my count, and depending on what you classify as “original” you’ll end up with some fluctuation in your own tallies. I decided adaptations of historical events or people themselves were not enough to get classified as unoriginal, unless they were specifically adapted off a work. So in the case of Disney films like Hercules, Mulan, and Pocahontas—these count as original films based off historical or mythical events and characters. The Hunchback of Notre Dame? Adaptation. The Lion King? Well it’s a ripoff of Shakespeare, but counts as original in this instance (and Shakespeare himself isn’t exactly the font of unbridled creativity he’s sometimes portrayed as.) Also counted as “original” are parody movies (e.g. Scary Movie). There are some films I legitimately saw as toss-ups, such as the recent Maleficent, but counted as non-original because they were at least heavily drawing on a previous film, aside from previous folklore. There’s some takeaways here. 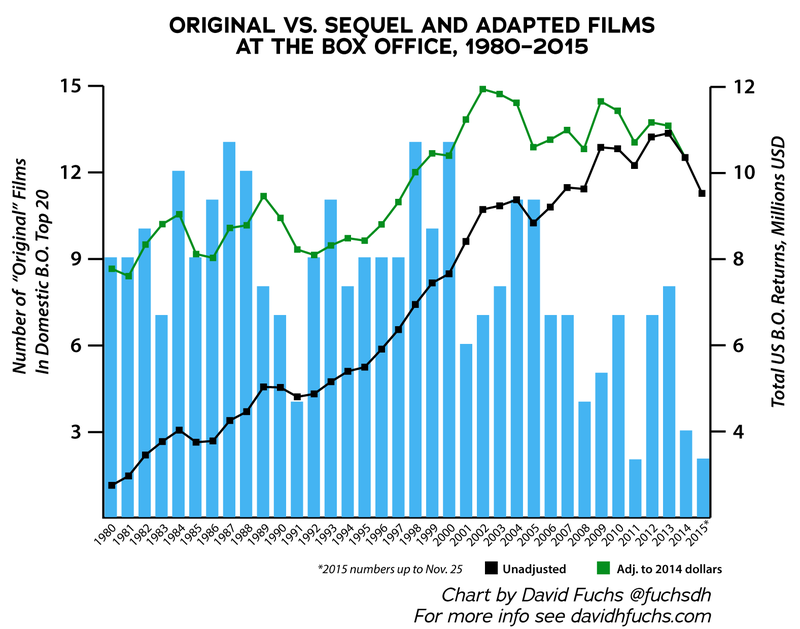 First, in the selected period, there is a definite trendline of fewer original films, though it’s skewed heavily by just the last few years where the number has been historically low. Secondly, that drop can be mostly explained by “superhero movies” and “animated sequels”. 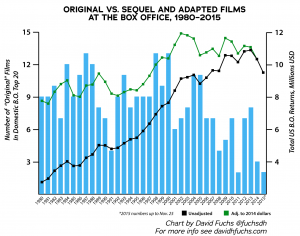 I included the original and inflation-adjusted domestic grosses for each year to suggest a possible counterpoint: that despite how much we complain about sequels, about how bad CG is, and how the 80s were the good old days, the increasing number of adaptations and sequels doesn’t seem to have actually hurt Hollywood. At least yet.